I found this book in a second hand bookstore today. Kat Colorado - the real one, not me - is an exbartender and works as a P.I. in Sacramento/CA. Her best friend Charity Collins, an agony aunt for a newspaper, needs her help. Her husband has taken 200'000 dollars out of their common funds, all there was actually and is missing, presumably in Las Vegas. Kat follows Sam Collins to the city of glitter and glimmer into a rat's nest of sleazy real estate deals, heavy hitting mobsters and contract killings. She doesn't back off, even when her searchings put her own live at danger. 9. nice-cup-of-tea (Switzerland)<--- Kat ist hier!!! Nun denn, am Wochenende habe ich es endlich gelesen und sobald ich sanne2´s Adresse habe, kann es weiterreisen. Wooh, that was my first contact with Kat Colorado and it was very pleasant. Luckily I have the following next two books of the series here, unluckily in german, but I think they will be my next read ( after another one or two rings to be done first ). Sooo, nachdem Katwalk sogar mit in Basel war, wo ich auch die Namensvetterin CatColorado getroffen habe, habe ich das Buch nun durchgelesen. Jetzt darf als nächstes coco7 lesen! One more crime series I have to read! I liked Charity's column, too. Kam schon vor einigen Tagen an, wird so bald wie möglich gelesen. I really like P.I. Kat Colorado. She reminds me a bit of Marcia Mullers Sharon McCone books. The book has arrived well and I'm looking forward to reading it. Thanks everybody! kat arrived at my home, looking forward to get to know her. I like Kat Colorado, her character is just great. She's so human and i just had to like her. Even if the story sometimes isn't worth so much, Kat makes it all up and this definitely won't be the last book of these series I've read! Now the book is with me and I am already curious getting to know the "real" Kat Colorado after I already know the Bookcrossing KatColorado quite well. Thank you for the ring! I enjoyed this book during my vacation on a greek beach! It was a fast read. The story is not always convincing, but who cares. I especially liked the part when Kat tries to impress her new boyfriend with making pancakes. The book describes a lot of features of every day American life I had nearly forgotten. I was reminded a lot of the time I spent as an exchange student in California. I guess I will return it to KatColorado during the December Meetup in Zürich. I will return the book to KatColorado at today's Bookcrossing-Meetup in Zurich. Lent to me by the lovely KatColorado at tonight's meetup! The PI KatColorado was a great character, no nonsense, liked her food, drink & men - I approve! Favourite quote? "I can run 5 miles, swim two moves, move pool tables my myself, and leap short, squat buildings in a single bound. I can talk tough, drink shots of Wild Turkey, and eat very hot Mexican food." Now that I know and really like "our" Kat, I have to get to know the fictional one too. 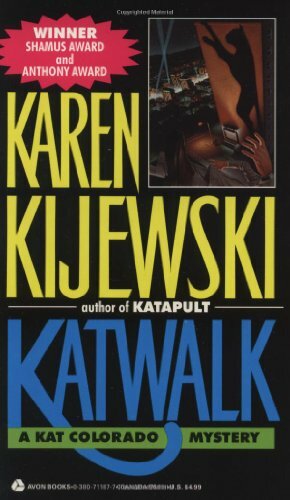 I took this book home form the March meet-up and will return it to the real Kat as soon as I've read it. Looking forward to the story already! I really liked the style of this book! Short chapters with witty intros followed by enthralling story-parts - a page-turner! Not to mention that Kat Colorado is a really cool cat! I would love to meet her again in another story.